Make your recipe stand out beyond comparison. We all know Love makes everything taste better! 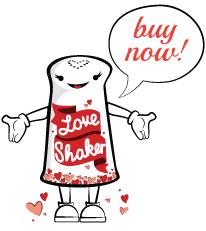 Love Shaker adds the secret ingredient that makes every meal special. Place your Love Shaker on the table at a dinner party. Just say “please pass the love” … and see what magic happens. Use the Love Shaker as a way to bless your food. Ask each person to add LOVE to the food with a word of gratitude and a shake of LOVE. Each meal can be a happy meal! The Love Shaker is a fun and playful way for kids to participate in food preparation. When the kids are helping mommy make a special meal or grandma put love into the pancakes, there’s always room to include more LOVE. They can shake LOVE into the recipe to their hearts content! Kids love the Love Shaker. They’ll want to add the magic of LOVE to every meal!